Here are 12 tactics to help you take control of how you look in Google search results. David Erickson, Karwoski & Courage’s VP of Online Marketing, is interviewed on WCCO TV about managing your reputation online. On the very eve of 2016, we looked back to see which were the most popular posts for the Success @ Creative PR blog, according to pageviews. 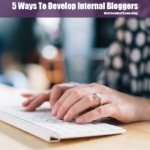 Five ways to identify, develop and nurture employee bloggers. Though the Google Fonts site has been around for awhile, it just got an overhaul that makes it easier and much more fun to use. Companies sometimes struggle with the question of whether or not to include bylines on the corporate blog. In the online environment, social proof is commonly understood to be those elements of online content that indicate the level of interest others have in that content. Hootsuite is a very popular social media management tool that provides pretty much all the features you’d need to manage the major social networks. The practice of blogging encompasses all of the disciplines that are required to excel at modern communications. 10 lessons I’ve learned from blogging. Tumblr has released a new Gif Making feature to make custom animated Gifs easy to make and higher in quality.